Lace panels made from recycled plastic shopping bags. Information in digital format is tied to the physical device on which it was created and stored. Computer hardware, software and operating systems are continually evolving, creating Digital Obsolescence*, where data is no longer accessible because the media to read it does not exist anymore. Email and social media sites have essentially replaced letters. Communication between friends, family and lovers is increasingly in digital format. Are all modern stories then doomed to disappear? 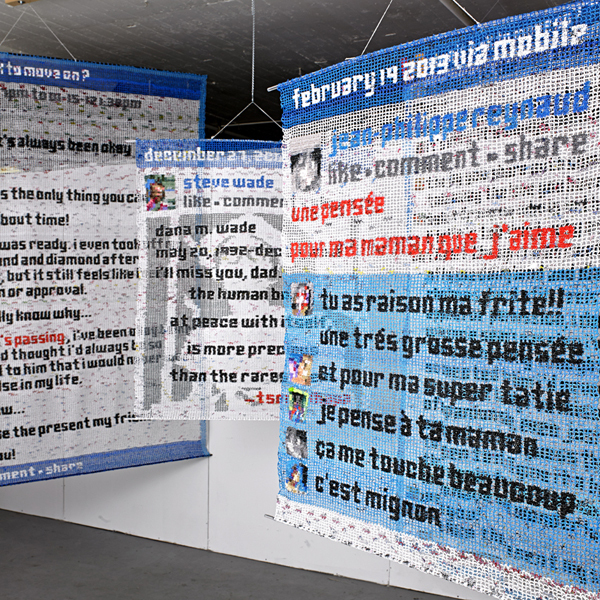 Love and Death, Archiving the 21st century aims to chronicle our times through a tangible form that is representative of the digital medium and of our legacy as a society. 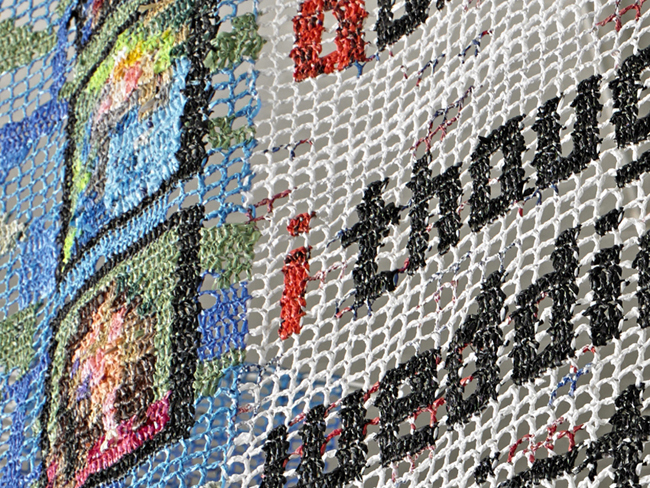 Using lace technique with thread made from recycled plastic shopping bags, I record Facebook posts and Friends' comments, Tweets and Text Messages. Lace is a traditional feminine craft, aptly in opposition to computer science which has become a male dominated field. Yet the technique has a lot in common with computers, since it also uses a binary method to display a message. Like a machine using ones and zeroes to manage complex operations, the lace is formed into a grid, and squares are either filled (one) or left empty (zero) to display words and embellishments. 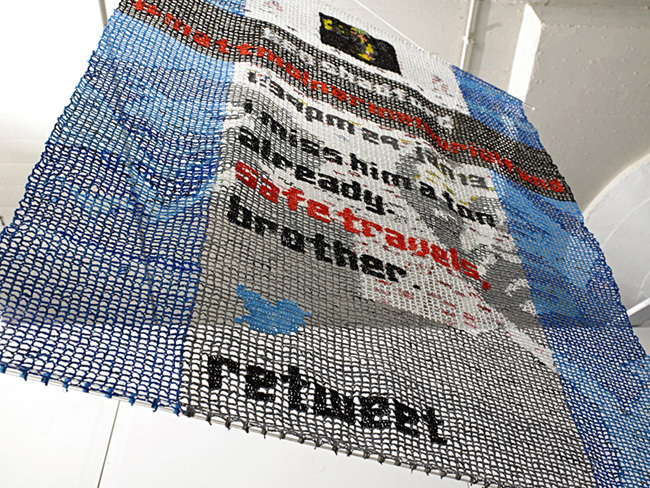 Recycled plastic shopping bags are cut and used as thread for this project. Plastic is a modern material that best represents who we are as a culture. It is indispensable and it is completely unnecessary; it is vital to our modern lives and it is harmful to our environment; it is a true technological achievement and a sign of our failure. Ironically, plastic will most likely endure past our digital age.